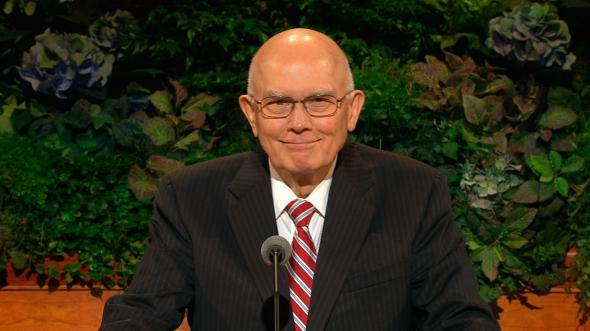 Elder Oaks’ talk has seen the most reaction from the bloggernacle. Since the church takes a while to transcribe these, I have decided to transcribe his talk from yesterday. You can also see it on the official church website by clicking below. What are your thoughts? At this conference, we’ve seen the release of some faithful brothers, and we have sustained the callings of others. In this rotation, so familiar in the church, we do not step down when we are released, and we do not step up when we are called. There is no up or down in the service of the Lord. There’s only forward or backward, and that difference depends on how we accept and act upon our releases and our callings. I once presided at the release of a young stake president who had given fine service for nine years and was now rejoicing in his release and in the new calling he and his wife had just received. They were called to be the nursery leaders in their ward. Only in this church would that be seen as equally honorable. While addressing a women’s conference, President Linda K. Burton of the Relief Society said, “we hope to instill within each of us a greater desire to better understand the priesthood. That need applies to all of us, and I will pursue it by speaking of the keys and authority of the priesthood. Since these subjects are of equal concern to men and to women, I’m pleased that these proceedings are broadcast and published for all members of the church. Priesthood power blesses all of us. Priesthood keys direct women as well as men, and priesthood ordinances and priesthood authority pertain to women as well as men. President Joseph F. Smith described the priesthood as “the power of God, delegated to man by which man can act within the earth for the salvation of the human family.” Other leaders have taught us that the priesthood is the consummate power on this earth. It is the power by which the earth was created. The scriptures teach that this same priesthood, which was in the beginning, shall be in the end of the world also. Thus the priesthood is the power by which we will be resurrected and proceed to eternal life. In controlling the exercise of priesthood authority, the function of priesthood keys both enlarges and limits. It enlarges by making it possible for priesthood authority and blessings to be available for all God’s children. It limits by directing who will be given the authority of the priesthood, who will hold its offices, and how its rights and powers will be conferred. For example, a person who holds the priesthood is not able to confer his office or authority on another, unless authorized by one who holds the keys. Without that authorization, the ordination would be invalid. This explains why a priesthood holder, regardless of office cannot ordain a member of his family, or administer the sacrament in his own home without authorization from the one who holds the appropriate keys. With the exception of the sacred work that sisters do in the temple under the keys held by the temple president, which I will describe hereafter, only one who holds a priesthood office can officiate in a priesthood ordinance. All authorized priesthood ordinances are recorded on the records of the church. Ultimately, all keys of the priesthood are held by the Lord Jesus Christ, whose priesthood it is. He is the one who determines what keys are delegated to mortals, and how those keys will be used. We’re accustomed to thinking that all keys of the priesthood were conferred to Joseph Smith in the Kirtland Temple. But the scripture states that all that was conferred there were “The keys of this dispensation.” At General Conference many years ago, President Spencer W. Kimball reminded us that there are other priesthood keys that have not been given to man on the earth, including the keys of creation and resurrection. The divine nature of the limitations put upon the exercise of priesthood keys explains an essential contrast between decisions on matters of church administration, and decisions affecting the priesthood. The First Presidency, and the Council of the First Presidency and Quorum of the Twelve, who preside over the church, are empowered to make many decisions affecting church policy and procedures. Matters such as the location of church buildings, and the ages for missionary service. But even though these presiding hold and exercise all of the keys delegated to men in this dispensation, they are not free to alter the divine decreed pattern that only men will hold offices in the priesthood. I come now to the subject of priesthood authority. I begin with the three principles just discussed. One, priesthood is the power of God delegated to man to act for the salvation of the human family. Two, priesthood authority is governed by priesthood holders who hold priesthood keys. Three, since the scriptures state that all other authorities and offices in the church are appendages to this Melchizedek Priesthood, all that is done under the direction of those priesthood keys is done with priesthood authority. Thus, it is truly said that the Relief Society is not just a class for women, but something they belong to, a divinely established appendage to the priesthood. We’re not accustomed to speaking of women having the authority of the priesthood in their church callings. But what other authority can it be? When a woman, young or old, is set apart to preach the gospel as a full-time missionary, she is given priesthood authority to perform a priesthood function. The same is true when a woman is set apart to function as an officer or teacher in a church organization under the direction of one who holds the keys of the priesthood. Whoever functions in an office or calling received from one who holds priesthood keys, exercises priesthood authority in performing her or his assigned duties. Whoever exercises priesthood authority should forget about their rights and concentrate on their responsibilities. That is a principle needed in society at large. The famous Russian writer, Alexandr Solzhenitsyn is quoted as saying, “it is time to defend not so much human rights, as human obligations.” Latter-day Saints surely recognize that qualifying for exaltation is not a matter of asserting rights, but a matter of fulfilling responsibilities. The Lord has directed that only men will be ordained to offices in the priesthood, but as various church leaders have emphasized that men are not the priesthood. Men hold the priesthood with a sacred duty to use it for all of the children of God. I testify of the power and blessings of the priesthood of God, available to his sons and daughters alike. I testify of the authority of the priesthood which functions throughout all of the offices and activities of the Church of Jesus Christ of Latter-day Saints. I testify of the divinely directed function of the keys of the priesthood, held and exercised in their fullness by our prophet president Thomas S. Monson. Finally, and most important, I testify of our Lord and Savior Jesus Christ, whose priesthood this is, and whose servants we are, in the name of Jesus Christ, amen. As was our mother Eve, she was not a queen unto her husband, and he is not her head as only the Lord is her head, he has no dominion over the woman, or over the earth. He is a husbandman and has a stewardship. May I speak boldly Satan and the Lord do battle over dominion. We has woman are to covenant to with the Lord to be a help meet unto man. D&C 22:1 That is the New and Everlasting Covenant of our Baptism… to become part of Them again, redeemed from the fall…and inter in at the strait gate through immersion in the water and the blood, we are cleansed of our sins…being born again and by partaking these emblems of the sacrifice of Their Son…and promising to obey His commandments…because by Him were we created in Their Image…Male and Female…Then we can receive The Fire of The Holy Ghost, He is a Revelator and Testifier of All Truth where in ye are justified…to enter again into the Kingdom of Heaven! 8 He had reference to those (Women) whom God should call in the last days, who should hold the power of priesthood to bring again Zion, and the redemption of Israel; and to put on her strength is to put on the authority of the priesthood, which she, Zion, has a right to by lineage; also to return to that power which she had lost.